As one of the strangest, most fascinating countries in the world, Japan, Land of the Rising Sun, has an equally interesting, influential and unique capital. Mad, fun and more than a little bit kooky, Tokyo offers the very best of modern entertainment alongside ancient traditions and ways of life, making it way up on the list for most travellers! And though Tokyo's pricy reputation can put the economical traveller on edge, a limited budget shouldn't stop you from enjoying this awesome Asian city! There's much to see and do for minimal yen! 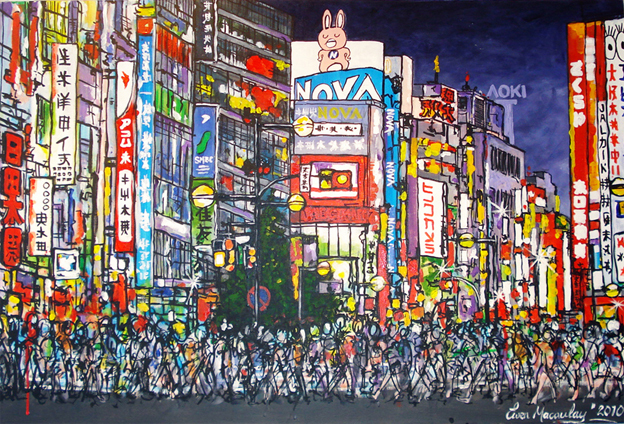 Tokyo is the capital of quirk and one of the busiest places on the planet - just to stand in its streets is an experience! The Japanese have one of the highest life expectancies in the world. Why? Largely because of their diet. Japanese food is healthy, delicious and can be incredibly cheap if you know where to look and avoid expensive tourist restaurants. From sushi to ramen to some of the best food on the planet, Tokyo is taste central and has the highest number of bars, restaurants, cafes and eateries of any city in the world - over 140,000. So whatever food takes your fancy, you can guarantee to find it. In the land home to cosplay, manga, and tonnes of imaginative make-believe, hundreds of themed restaurants make the experience even more fun. So name your theme - you'll probably find an eatery to suit! A cluster of 26 districts, 23 wards, 8 villages and 5 towns, Tokyo as a whole is huge, but there are plenty of cheap and even free attractions to be found amidst its boundaries! For an infamous scenic visit, visit the busy four-way crossing in Shibuya, by the station, or head to the 'cool district', Harijuku on a Sunday to witness the latest in youth fashion culture - this is cosplay and dress up central, so bring a camera! Nearly every conceivable look will grace the streets here, so it's quite the colour scene. Tsukji Fish Market in the Marunouchi & Ginza district is the world's largest seafood market, so well worth a look. From the tuna auction at 5am (arrive by 4.30am) to the sight (and smell) of hundreds of varieties of fish, it's a market you have to see to believe. It's an early start though, and most of the bustle will be over by 11am. But while you're in the area, why not check out the shopping scene in the rest of the Ginza area? Alternatively if you're looking to escape the rush of the city, Higashi-Gyōen, or The Imperial Palace East Garden is a beautiful Imperial retreat, open regularly to the public and free. If you're heading to Tokyo, don't expect to stay in spacious sprawling luxury! With over 35 million people living here (in a city measuring 13500 square kilometres - thats a population density of 2642 people per square kilometre!) space is a serious commodity. But that's all part of the fun! From cute little capsule quarters to rooms the size of a closet, Japan's miniature living makes staying in Tokyo a unique experience - just watch your wallet. Despite their modest rooms, hotel rates can be sizeable! But from traditional to contemporary - and very futuristic - there are still places to stay for cheap. Look for business hotels and basic hostels - or go for a local stay to save some yen. Hotels - The Hotel Hoteiya in the Shitamatchi District costs the equivalent of £31 for a double room. Popular with budget travellers it is minimal, but has WiFi, laundry, and satellite TV, but be warned - bathrooms are shared. For something more upmarket, the Shinjuku Washington Hotel is close to the Harijuku district and offers reasonable room rates - just avoid the costly hotel bars and restaurants! Hostels - Khaosan Tokyo Annex - one of the cheapest hostels in Tokyo at ¥2300-5000, has regular discounts. Guesthouse - K's house (little more expensive but a backpacking favourite due to its homely feel (tatami communal area) - it's more like an apartment than travel accommodation. Ryokan - Those hoping for a more traditional stay can still find it - even on a budget! Traditional Japanese inns, or ryokan such as Ryokan Katsutaro in the Yanaka district, nearby to the shopping and food hall mecca of Ginza, offer a more historical stay experience, though amenities like WiFi are still available. You can expect to pay around the equivalent of £70 a night for a double room here. Eating and finding things to do are the cheaper sides to Tokyo trips, so expect to budget a little more for your accommodation. Also, be aware that some budget to middle-price hotels may not accept cards - unless you've already paid, it's best to bring cash. In fact you'll find the Japanese prefer cash in most situations - great for the shoestring traveller who needs help controlling their budget! Travelling around - Avoid expensive taxis, and either walk, hire a bicycle or use the metro - it's cheap and simple to navigate, even to non-Japanese speakers. Other options such as busses are more difficult without much Japanese ability, but will still save your wallet from taking a hit! If you're planning to stay out late, seek out some sushi and sake, and try a little karaoke but don't forget about the train time limits. Trains in Tokyo stop running at midnight and start again at 5am. But if you end up stuck after midnight, don't panic! A capsule hotel (often also expensive) isn't your only option. Some manga kissa (an alternative sort of coffeeshop/ media entertainment centre) offer overnight facilities along with their regular DVD, gaming, coffee and recreational amenities.They cost around ¥2500 for eight hours. Choose your season wisely - You can make your trip even cheaper if you travel off-peak, as prices change dramatically. Spring and autumn are the most popular and pricy times to go as the weather is more pleasant and the city will either be completely in bloom with cherry blossoms (March-April), or coloured by autumn leaves (October). Lucy is a freelance writer and travel blogger and she provided this article on behalf of Communicaid a cultural and business communication skills consultancy based in the UK.